The advisory comes in the wake of the recent bad weather conditions along the pilgrimage route and the consequent stranding of pilgrims for over a week. Scores of Indian pilgrims were evacuated from Nepal's mountainous Hilsa region yesterday. The External Affairs Ministry has issued an advisory for pilgrims planning to undertake the Kailash Mansarovar Yatra through Nepal, saying that there were "high chances" of getting stranded in various legs of the journey in case of bad weather. The advisory comes in the wake of the recent bad weather conditions along the Nepalganj-Simikot-Hilsa route of the Kailash Mansarovar Yatra through Nepal, and the consequent stranding of pilgrims for over a week. The advisory said the prospective pilgrims should note that Simikot and Hilsa in Nepal are connected to rest of the world only by air through small aircraft and helicopters. These small aircraft and helicopters can operate only when the weather is absolutely clear in these places and their adjoining areas, as the terrain and the route is extremely dangerous, the advisory said. In case of poor weather, there are high chances of pilgrims getting stranded in various legs of the yatra, the advisory stated. Noting that Simikot and Hilsa are extremely infrastructure lean places lacking medical facilities and comfortable boarding and lodging, the advisory said pilgrims should get themselves medically examined before starting the yatra and carry medicines for up to a month. It also asked all prospective pilgrims, state governments and tour agencies to apprise themselves with the ministry's advisory issued in April and implement it in letter and spirit. In the April advisory, the ministry had said that Indians travelling for the yatra through Nepal should ensure that they have appropriate Chinese visa and travel permit for Tibet in hand before commencing their journey. It had said that the pilgrims should note that they would be traversing Simikot and Hilsa on their way and both these places have inadequate tourist and medical infrastructure, and are prone to inclement weather due to which to-and-fro flights get disrupted. The External Affairs Ministry has also provided a list of emergency contact numbers, some of which are Sh. Pranav Ganesh, First Secretary (Consular): 9851107006, Sh. Tarun Kumar, Attache (Consular): 9851107021 and Sh. Rajesh Jha, Assistant (Consular): 9818832398. 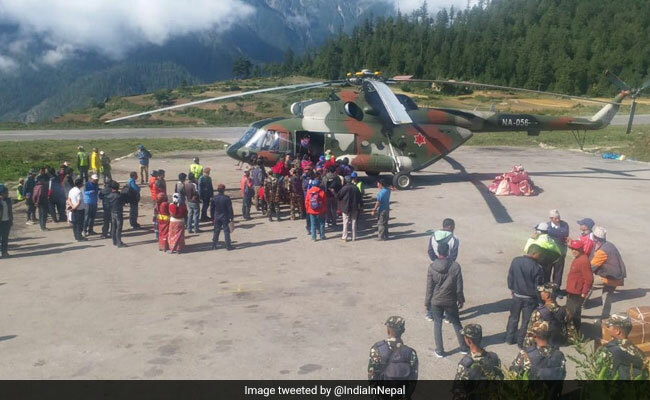 Scores of Indian pilgrims were evacuated from Nepal's mountainous Hilsa region yesterday, as authorities stepped up efforts to rescue those stranded there due to heavy rain while returning from the Kailash Mansarovar pilgrimage in Tibet.